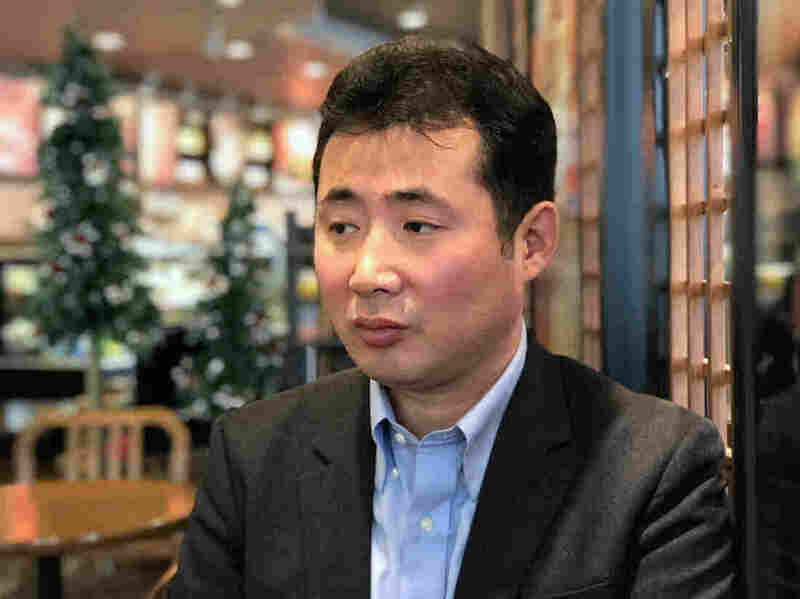 For A North Korean Defector Turned Journalist, Warming Ties Are Cause For Worry South Korea barred Kim Myong Song, a reporter for the Chosun Ilbo newspaper, from covering a meeting with North Korean officials. He believes they were concerned his presence could derail the talks. South Korean journalist and former North Korean defector Kim Myong Song speaks at a cafe in Seoul. The government's decision to ban him from covering an inter-Korean meeting raised concerns about press freedom. Kim Myong Song, a reporter for one of South Korea's biggest daily newspapers, the Chosun Ilbo, remembers rushing to cover a high-level meeting of North and South Korean officials early one morning in October. Kim covers the Unification Ministry, which is in charge of inter-Korean relations. He also happens to be a defector from North Korea. On the way to the bus that would take him to Panmunjom, the border village where the talks were taking place, the ministry called to tell him he had been barred from covering the event. "I felt so betrayed and angry," Kim tells NPR. "I could understand it if I was an inexperienced newcomer. But I've been covering the ministry for six years." The ministry never really explained why it barred Kim. A spokesman simply said the ministry took "necessary steps" because of "the special circumstance." He also noted that Kim is known for his "active reporting," without elaborating. Its actions came at a time when the leaders of the two Koreas seem intent on taking unprecedented steps toward improving relations. The leaders of both countries met three times in 2018. Kim and other defectors believe that their experience of living under the North Korean regime gives them a role to play in this process. Kim speculates that officials shut him out because they were concerned that having a defector in the room could offend the North Korean officials and derail the talks. Kim is not the only defector turned journalist in South Korea, but he is the only one covering the Unification Ministry. This is the first known instance of the ministry targeting a specific journalist for exclusion. "North Korea considers defectors as traitors to the country and the people," Kim explains, "and they harshly criticize their activities in South Korea." Kim says his company has supported him, and he continues to cover the Unification Ministry. Other journalists, defectors and human rights activists sprang to Kim's defense and slammed the ministry's action. Among them was defector Choi Kyong Hui, president of a civic group called South and North Development. who pointed out that Kim was going to cover talks in South Korea, not North Korea. "In a democratic society," she argues, "no individual or official has the right to restrict journalists working for the people's right to know." The ministry never apologized to Kim. The ministry budgets approximately 500 million South Korean won or about $449,000 per year for defector groups it considers "civic movements for unification," but some defector groups complain that the ministry has cut funding for their activities. Kim, 43, grew up in Hamhung, North Korea's second-largest city, and studied information technology. He left North Korea in the 1990s, after listening to South Korean broadcasts on shortwave radio, which could pick up signals from the South. He was amazed to learn from those broadcasts that North Korea's poverty and famine were largely the result of its own policies. "Once I found the truth, I grew to hate the North Korean regime," he says. "I didn't want to sit and watch the North Korean television jabber every day. I felt a strong urge to experience life in the outside world." After years on the run in China, Thailand, Vietnam and Cambodia, which he had entered illegally, Kim finally made it to South Korea in 2002. Now, Kim says he fears that amid the diplomatic courtship between the two Koreas, defectors are being silenced and South Korea may be falling into a trap. A defector and cartoonist says he was booted from a radio show after criticizing Kim Jong Un, though the network denied it. Another defector and activist says news programs shunned him after he spoke unceremoniously of Kim's sister. "Our government is betting everything on peace negotiation with the North," he says. "I am concerned that they're leaning too far to one side. The nature of North Korean regime hasn't changed." South Korean President Moon Jae-in is a veteran human rights lawyer who has spoken up for press freedom. In a speech on Human Rights Day last month, he linked human rights with improved relations with the North. "Peace will guarantee human rights, and that will secure peace," he declared. Moon Chung-in, a special adviser to the president on foreign affairs and national security, says resolving the North Korean nuclear issue is the administration's top priority. When it comes to North Korean defectors, he is blunt: "North Korean defectors might not enjoy the same benefits that they enjoyed during the two previous conservative governments," he says. By the same token, South Koreans who have publicly welcomed news of the North Korean leader's expected visit to Seoul are now free to express their support of Kim, something that might have resulted in prosecution under national security laws during previous administrations. All this makes Kim Myong Song apprehensive about his future as a journalist in South Korea. Before the government banned him from covering the inter-Korean meeting, he says, the peace process had actually given him hope: that someday he could report from Pyongyang, as a South Korean correspondent. These days, it seems he can't even report freely from Seoul. NPR Seoul Bureau news assistant Se Eun Gong contributed to this report.